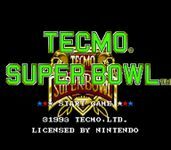 A sequel to Tecmo Super Bowl for the NES, released for Super Nintendo and the Sega Genesis in 1993. It added several new features including touchbacks, variable weather conditions (clear, rain, or snow), a short yardage dive play, in-game playbook editing, and several graphical improvements. It also included 1993 rosters, and the ability to play a three season franchise mode.